To provide unique volunteering and learning opportunities at a renowned NGO in a clean, tranquil and serene campus with world-class facilities in the heartland of rural India. To bring youths from across the world together to provide a sense of global community, camaraderie, responsibility and spirit of volunteerism. To help youth get a glimpse of the rural/tribal community and their lifestyle. To create appreciation of how cutting edge technologies and renewable energy can be harnessed to meet needs of the society. To expose the youth to an integrated approach (education including vocational training, healthcare, childcare, care for the disabled and the elderly, women empowerment, sustainable agriculture and organic farming, and innovation in renewable energy and recycling of waste) taken towards the development of the rural society. 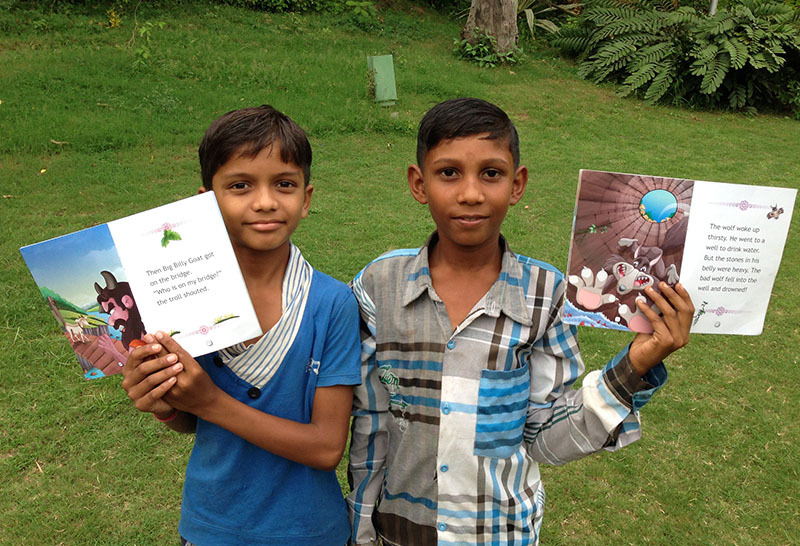 To learn India's culture in an Ashram setting that India’s forefathers envisioned. To explore different professional career paths. Shadow the medical staff and see how they see the patients, diagnose and treat the disease. Understand various schemes and subsidies, provided to the rural poor by the government, and their implementation by the Ashram. Experience the working and operations of a world class medical facility in a small village in tribal area of Gujarat. Spend quality time with children and participate in their activities to help broaden their worldview. WI-FI is provided in some areas of the ashram from where Internet can be accessed on students' laptops and smartphones. Because of its rural location students may experience intermittent loss of connectivity. Youth do not receive any academic credits. However they will be given certificate of participation which may satisfy requirements at some schools and colleges. 16 years or older. Most of the students have completed their tenth grade. We strongly advise that students should attend the full camp duration of 2 weeks. The Muni Seva Ashram has been a memorable experience where the people have truly altered my outlook on rural life within India. The children we were teaching English at Baxipunch are amongst the most jovial, considerate people I have ever met. Never did I have to worry in this ashram, if I was cut while playing WWE with the children they would immediately get me water and dress my wounds. Teaching English to the children has truly piqued and developed my interest in teaching. Their wonderful personalities classic comments during class made teaching a task I looked forward to everyday. They would even take as much time as possible to teach me one word or one custom they followed, because they also cared that I learned about their country. The talent these children withhold is boundless; there was a child I met who had taught the piano to himself and could compose music without the need of musical notes. Another case of talent and hard work, was when I met a national level kabbidy player who had gone from rural India to play on the national team. These children have slightly altered my goals in the future due to their love and kindness and revised it to add their country as one I must revisit and teach in once again. 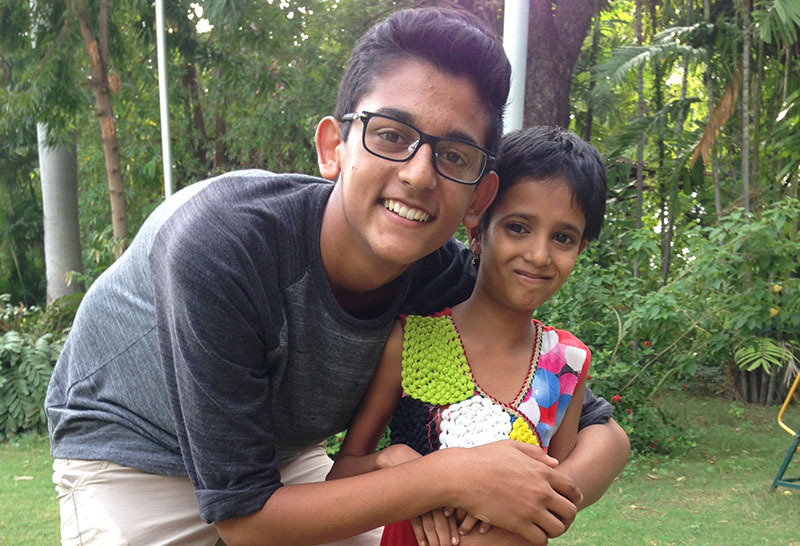 Spending two weeks in a village in India, volunteering at a hospital and getting to play with school children is something I never thought I would experience. A few of my friends had attended Muni Seva Ashram in previous summers and always tell me how great of an opportunity it was. Many of them are interested in medicine and said that it gave them insight into the health care system of India. Many of them said it showed them the lifestyle of rural Gujarat. Every person I talked to had only positive things to stay about their stay at the ashram. When I found out that there was a camp this summer, I was really excited to sign up. To be honest, I was a little nervous about going by myself but when I found out Aashana would be going as well I got really excited. The main reason I wanted to attend this camp was because I thought it would be a great opportunity to gain hands-on experiences with patients that I could not get in America. I want to pursue a career in medicine so I thought I could gain some valuable insight on the field. I hoped to learn more about the patient care and health situations in rural India. When I got to the Ashram, I was very surprised. I had been reading the website and watching videos but nothing prepared me for what I saw when I got here. I have never known much about solar power and renewable resources but when I learned about how the ashram runs on solar energy I was amazed. I honestly was pretty amazed when I came to Muni Seva Ashram. So far it has fulfilled my expectations and I cannot wait for what is to come. The lives of those living in rural India do not come close to the lives of those in the US. Coming to Muni Seva Ashram has opened my eyes and has made me realize how fortunate my life in America is. 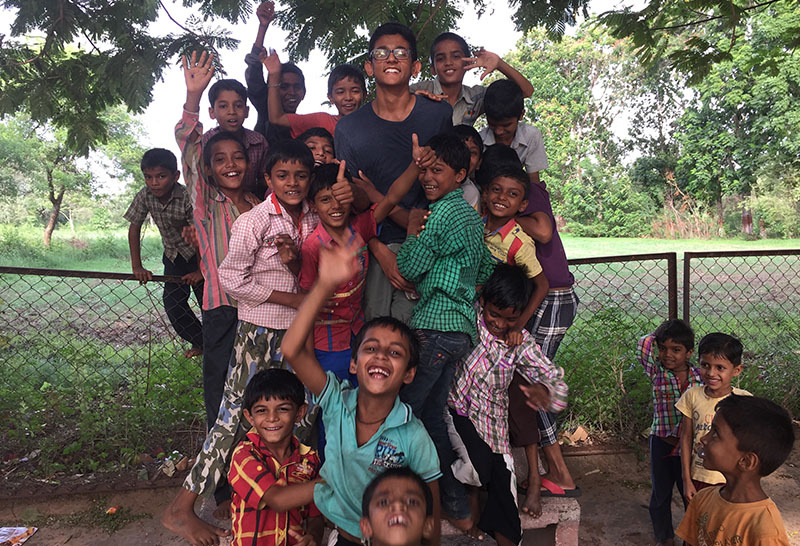 The main reason I came to the camp was to experience how the ashram aids surrounding villages through health care, education, and sustainable ways of living. Going to the hospital everyday and seeing how different doctors treated villagers from Goraj and beyond was a treat. Meeting the kids from Parivar Mandir and Baxi Panch helped me create unbreakable bonds with them. Even at Bhagini Mandir, the women were given the respect they deserve. Seeing how solar energy is harnessed as a source for food and energy had really shown me that even in villages, people make an effort to conserve valuable resources. The majority of the campers wanted to go into medicine. Even though I don't want to go in that path - instead finance path - the knowledge I received through the hospital was enlightening. In the OPD we made rotations through General, gastro, dental, and internal rooms. Going through each of them gave me a different view of what each doctor does. I discovered that the villagers do not like to take their medicine. After a few OPD sessions we visited the operating theater. We saw a few surgeries but I did not have the guts to go up close to see the full thing. The majority of the patients operated on have cancers caused by tobacco. Seeing the pain these patients have to go through is unbearable. Muni Seva Ashram will be starting a campaign to reduce the use of tobacco and educate children about the effects of it. Teaching at Baxi Panch Primary school was an eye opening experience for me. Teaching the 7th grade and learning about children's lives in villages showed that there are greater things to life than materialistic items. I felt as if I were a celebrity and an alien because they all wanted to know who I was, where had I come from, and why I was there. They were mesmerized by an iPhone and begged to see pictures of America. I was constantly asked if I could take their picture, and they would grin ear to ear upon seeing themselves on a screen. 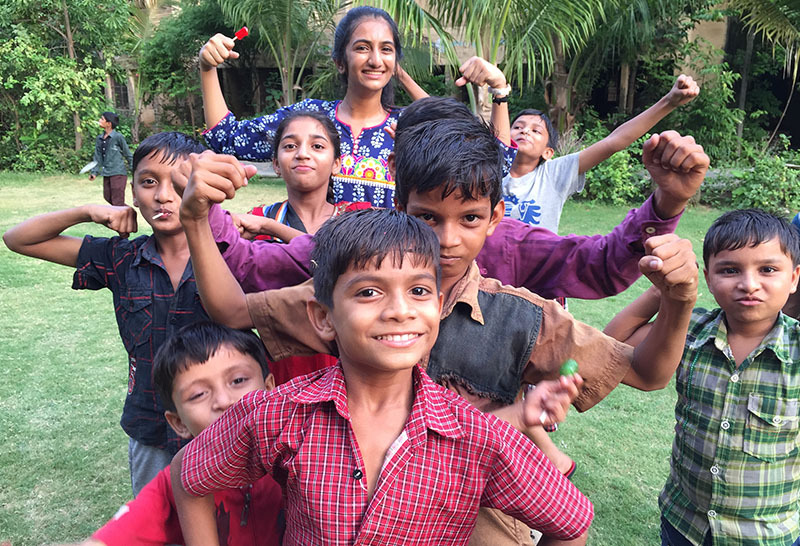 Meeting kids like Snehal, Montu, Hitesh, Dhawal, and Pintu helped me get a closer look into how these kids live in this area. I'm proud to call these boys and all of the school children my friends. 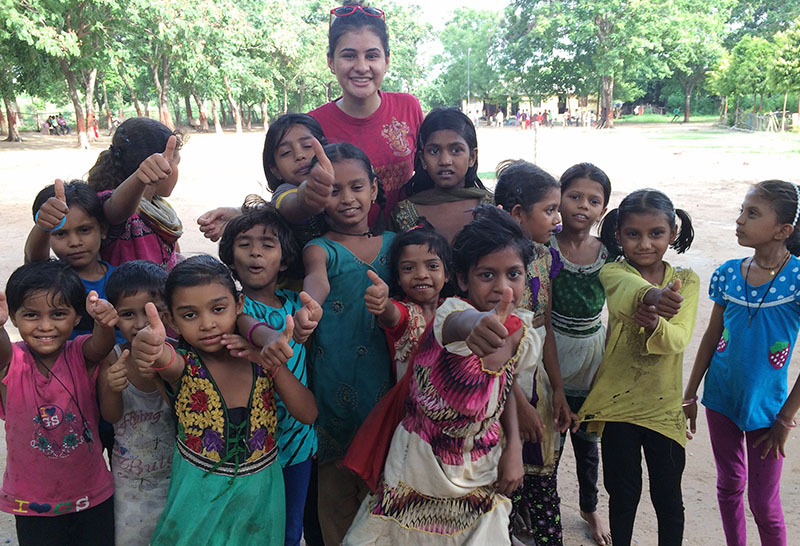 The students at Parivar Mandir were orphans and semi-orphans. Teaching them on the field everyday was one of my favorite parts of the camp. We would teach and then play. Talking to these kids personally really gave me perspective. A little girl had told me that she would live on the road and she would be lucky if she found any stairs to sleep on. She would barely get any food. One day her mom took her to the market and abandoned her. This situation had not only happened to her. There were a few girls I had the chance to speak with and heard the same story. Feeling the pain of your parent just abandoning you is something I cant fully grasp onto. The sad part is, is that this is a little girls reality. These kids are probably the most selfless people I have ever met and are my inspiration. Visiting Vankua high school helped me compare and contrast my school to theirs. The students basically live at school. Kids in America would dread to do that, but kids here have no choice. The way they teach here is way advanced than what I thought it would be. They learn about computers, robotics, politics, and have a smart class system using projectors. Students also can learn music, agriculture, and physical education, which is very similar to what we learn in America. It was great to connect with kids the same age as me and see how their life differs from mine. No matter who they are and what they have, one thing they deserve is respect which is what these ladies dont get, and it is disappointing. Luckily at the ashram, women at Bhagini Mandir get the care they deserve. Meeting these ladies and talking with them was very refreshing and showed me how to interact with different people in different situations. Interacting with the women at Bhagini Mandir helped me realize that no matter who you see, you must give them the respect they deserve. The mind set I came with and the mind set I left with are no where near each other. When I came, I was thinking that this would be a quick camp about health and education. What I am leaving with is an experience that I have never had before. I am leaving with a mind experienced of pain mentally and physically through the kids and patients. Living the way they do has shown me how fortunate I am on all levels. The camp at Muni Seva Ashram has been a very interesting experience. From experiences like the crowded lines in Pavaghadh to learning about healthcare, this camp has given me so much to take back. For me, I thought this camp was going to help me make a decision to choose my career path. Even though it did not help to make my final decision, I did at least determine that I want to pursue a career in the medical field. Imagine yourself in India, without your parents, trying to get a rickshaw. For the first time, I learned that I could manage myself in basically an unknown country, such as India. I also sharpened my Guajarati, which helped me converse with the kids and adults in India. One of my favorite parts of this camp was the conference with some of the best doctors in the ashram. In the conference we talked to two of the doctors about their point of view in their careers. They explained to us how hard they worked, their background, and their family's opinion on their career. The conference was very helpful because we are in the same position as they have been in the past. Another of my favorite aspects of this camp was how we were allowed to go visit our families at the end of the first week. Because my family lived close in Baroda, I was allowed to visit them Sunday night after we went out for a movie as a group. I thought we wouldn’t be able to see our family for two weeks, but the camp coordinator made time for us to visit our respective families, and additionally, had an open policy on family visitation at the ashram. We also shadowed several doctors to help us select our appropriate fields. For instance, we visited the OPD, pathology, radiology, radiotherapy and some of the surgeons. The doctors accurately explained their field and their daily routine with each of their patients. Moreover, we watched a surgery and we were about two to three feet away from the surgeons! Additionally our visits to the orphanage girls, women's mental institute, the Baxi Punch (the local elementary school), and Vankuva (the local high school) made me realize that we take a lot of things for granted. The kids and the women were so happy that we visited them because they also gained a new experience. We played special Indian games with the little boys and girls at Baxi Punch. When we visited Bhagini (women’s mental institute) we got to interact with the women there very closely. We actually conversed with them, which was really helpful for me because I have always wanted to volunteer at a mental institute. I have always had a passion for working with kids and people with mental illnesses like autism, dyslexia and more. 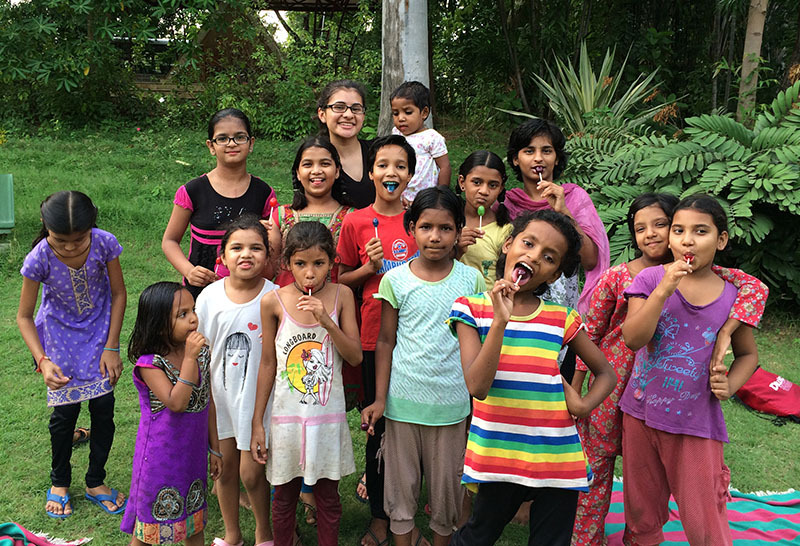 As a group, since we visited Baxi Punch, we got so close to the kids; it was so hard for us to leave them. The camp also had wonderful food including: Paneer Makhani, Pav Bhaji, and Pani Puri. Even though the last week we had khichadi, it was the effort that the people put in for us that counted. The cooks made special food for us, which was so delicious. If worst came to worst we could just visit the canteen where there was samosas, masala dhosa, utapam, and more. There are also desserts and drinks such as ice cream and limca, etc. Overall, Muni Seva Ashram has given me an experience of a lifetime. I would definitely suggest this camp to anyone confused about making decisions for his or her career like I was. Even if you do not want to pursue a career in the medical field, you will find many other things that you can enjoy at this camp. Imagine yourself waking up at 5:30, doing yoga, going to a hospital, learning about the different branches of medicine, talking to doctors, playing with local school students, eating Indian food all-day-every-day, then passing out at night because the day was so exhausting. This was the general outline of what a day at Muni Seva Ashram would be like for us, campers. But what was not explained in the description above were all the friendships we made along the way, all the different people we got to interact with, all the hardships we saw, and all the little children's days we brightened. These past two weeks have not only been for medical exposure, but also for the opportunity to grow as a person. I came to the ashram this summer hoping this camp would help me decide whether or not medicine was for me: to give me a definite answer. But it turns out I'm more confused than I was before. But I’m glad that I didn't find my yes or no answer. I'm glad this trip made me question my original mindset. I thought because I loved biology and chemistry, and was interested in human anatomy, being a doctor was good for me. The idea of becoming a doctor seemed so accomplishing, well respected, but the hidden, uncovered aspects of being a doctor was something I never thought about. There are many sacrifices that have to be made, which include many years of hard schooling, giving up family life, constantly on call, and much more. It's not about reaching your goal, it's about the journey getting there. If you don't love the process of becoming a doctor, you just want to be a doctor, doing this may not be for you. Talking to the doctors here really impacted my view of the profession. I've become more open minded to looking at what other occupations and jobs there are out there that are still science related but still want to try and pursue the medicine line. Any camp has its pro's and con's, and Muni Seva Ashram is no different. All of us campers would dread eating the khichdi for dinner every night and walking outside midafternoon when it was steaming hot. When the second week of camp started, we all started to get homesick. We missed our daily routines and lifestyles and just thought camp was too long. The trips both days to the Baroda hospitals were not as eventful as expected and we started the second week off in disappointment. On the other hand, there was plenty I enjoyed about camp too! Getting to watch live surgery was one of the coolest experiences for me because it was my first. The thrill of standing in the operation theater was nothing like I ever imagined. Spending time with the local students at the high school and primary school was really touching. Talking to them made me realize how different their lives are from ours and how blessed we truly are. The little things that brighten their days are things we take for granted at home and I most certainly won't now. Taking night trips to the small store near the ashram to get Limca and Maaza and chocolate and a bunch of snacks, and bonding over taboo during our lunch breaks are only some of the memories that I’m going to remember. While spending time here, I got to see how the ashram is helping people and really commend those who devote their time to making this place what it is. I spent the last two weeks with some great people and I learned a lot from this trip. The experience was unique for every person here, and we all took away something different from it. I got to see a completely different part of the world and a completely different way of life.